Understanding the gender dimensions of community-based groundwater governance is important because men and women differ in their need for and having access to groundwater, and their participation in the development, management and monitoring of the resource. The leading role played by women in obtaining and safeguarding water is not usually reflected in the institutional arrangements for water management. Addressing this gender inequality could lead to the equal participation of men and women in monitoring and sustainable management of groundwater, and women’s empowerment. 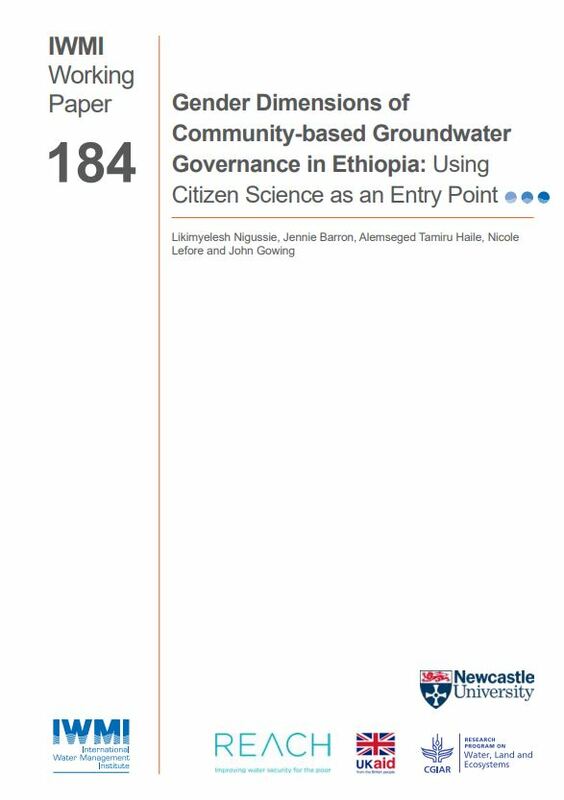 This paper explores gender aspects of community-based groundwater governance in Dangeshta and Farawocha kebeles in Dangila and Boloso Bombe woredas, respectively, in Ethiopia. The findings suggest that women place a high value on groundwater and could be motivated to play a greater role in governance of the resource. However, the constraints they face in participating in groundwater development and management, particularly exclusion from decision-making, suggest that their effective participation and leadership could be significantly curtailed without specific interventions. Indeed, this is reflected in women’s willingness to participate in groundwater monitoring, as well as men’s reluctance to allow their wives to participate. This is in contrast to a high number of men willing to participate. Citizen science as an entry point for community-based groundwater governance relies on (i) the active involvement of myriad actors (including men and women citizens) whose actions interact with the hydrological processes; and (ii) volunteer interest (i.e., willingness to participate). A gender-sensitive approach to programs, gender awareness training, and partnerships with organizations working for women’s empowerment, natural resource management and adult literacy are recommended to support a citizen science approach to groundwater monitoring. This research was funded by REACH through an accelerated grant, and by CGIAR Fund donors.